We love basil, parsley and cilantro for their amazing flavors and health benefits. That’s why the recipes and meal plans of The Fat Resistance Diet™ are filled with these aromatic herbs. We are delighted to share with you creative ways to get these herbs into your day, to maximize nutrition and flavor. These herbs are more available than ever, fresh or frozen at the supermarket, the farmers market, the natural food store. You can also plant an outdoor or indoor herb garden. Be sure to include three savory herbs with amazing health benefits: basil, parsley and cilantro. They grow equally well in the ground or in pots. All three are rich in disease-fighting, anti-inflammatory phytonutrients. Basil belongs to a family of aromatic herbs that includes rosemary, thyme, sage, oregano, mint and lavender. Its bright green color and fresh, tangy flavor make basil a favorite in Italian cooking. ursolic acid, which blocks inflammation where it starts, by regulating the activity of genes involved in triggering inflammation. rosmarinic acid, a powerful antioxidant with therapeutic potential in the treatment or prevention of asthma, ulcers, liver disease, coronary heart disease, cataracts, and cancer. Basil’s delicate aroma is produced by essential oils that have antibacterial, antifungal and antioxidant effects of their own. Parsley outstrips almost all other vegetables in its ability to raise the levels of antioxidant enzymes in your blood. Parsley gets its health benefits from a high content of carotenoids. It has almost twice the carotenoid content of carrots (the vegetable for which carotenoids were named) and is matched only by red peppers and kale. Parsley is used throughout all stages of The Fat Resistance Diet, in cooked meals and salads. Help rid your body of toxic metals by binding to them and promoting their detoxification. Parsley is used liberally in salads and cooked meals throughout all stages of The Fat Resistance Diet™. Cilantro flavors dishes like our Mexican Salad, Five Spice Chicken, Cilantro Shrimp with Pomegranate Salsa, Asian Grilled Chicken Salad, and several delicious frittatas. Herbs like basil, parsley and cilantro reveal one secret of The Fat Resistance Diet™. The magic is in the details. The way that meals are prepared and seasoned not only makes them mouth-watering, but also makes them anti-inflammatory. Jonathan Galland is a health writer for newspapers, magazines and major news websites. He is frequently interviewed as a weight loss and health expert on the radio and has appeared on Martha Stewart Living. His work has been featured in publications such as The Washington Post, Body and Soul, Self, Glamour and The Wall Street Journal. 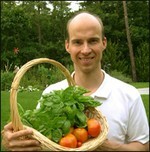 Jonathan is co-author of The Fat Resistance Diet, with his father Leo Galland M.D. Their book has been translated and published in Italy as La Dieta Galland. experiencing and allowed me to breathe better.